It was in 1993 that the first IHE Traffic Signs Symposium was held. In fact, both the first and the second occurred in November that year, at UMIST in Manchester and in London. The Department for Transport (or Department of Transport as it was then) had approached the Institute for its help in organising events to explain to signing practitioners the new Traffic Signs Regulations and General Directions (TSRGD) that would appear the following year. As this introduced some major changes to directional signing (the ‘Guildford rules’) and the yellow line system for waiting restrictions, there was a lot to learn. Speakers included Brian Lyus, Roger Mackintosh and the late Roger Elkin of DOT, and there were workshop sessions to explore questions and resolve issues of interpretation. Due to high demand, a third symposium was held in London in March 1994. This still left plenty of time before the regulations came into effect that August. At all venues there was space for exhibitors to display innovative products relevant to traffic signing, making the events even more instructive and useful. The feedback received was extremely positive, leading all participants to agree that this type of event should become a regular occurrence. However, it was not until April 1996 that the fourth signing conference was held, this time at the Warwickshire County Cricket Ground, and from then on it became an annual event. Buchanan Computing had been involved as an exhibitor from the very start, but 1996 marked the beginning of its long-term relationship with IHE in sponsoring these events – something it still does to this day. After Edgbaston, the Traffic Signs Conference and Exhibition moved to Loughborough University for 14 years, spent two years in Nottingham and then four at Aston Business School in Birmingham. 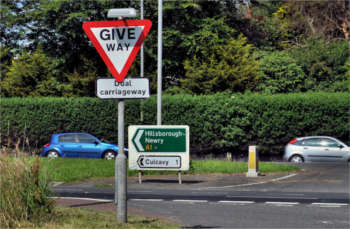 The Loughborough events were some of the best supported, with around 280 delegates attending in September 2001 to discuss a further major iteration of UK traffic signing – the result of a consultation draft of a proposed revised TSRGD having appeared the previous month. Many of the Loughborough conferences were enlivened by sign-related quizzes for delegates to complete and win prizes – a signing maze one year, and a ‘Signdoku’ the next, for example. Margaret Calvert (now OBE) attended in 2008 to celebrate 50 years of our system of traffic signing that she had co-designed, and to show her approval for these events. In 2013 the minister for roads and traffic, Rt. Hon. Norman Baker, chose the IHE conference to make an official announcement on future sign lighting requirements. The following year, IHE organised ‘roadshows’ for DfT in London, Leeds, Birmingham, Cardiff, Exeter and Cambridge to explain another major forthcoming TSRGD revision. The total attendance, including at two further London events, was over 1000. In tandem with these events, DfT also supported regular IHE training courses to introduce new practitioners to the intricacies of signs and markings. These were often held on an adjacent day to the Conference, to make it easier to attend both. This year’s event on 29 November moves back to London, and promises to be one of the most significant in view of the imminent release of revised chapters of DfT’s Traffic Signs Manual, which will be the main theme for the morning. Caroline Sheppard, the Traffic Penalty Tribunal chief adjudicator, will start the afternoon’s proceedings by shedding light on how it is possible to achieve good compliance and enforcement without excessive signing, and other speakers will look at the continuing need for good design skills. With exhibition stands from leading UK companies in the field too, it promises to be a worthy way in which to celebrate this quarter century of dissemination and discussion of traffic signing knowledge. Find out more and sign up to attend here.